Ongoing developments in Ohio legal cases have the potential to severely affect George Bush's claim on Ohio's electoral college votes; to blow the lid off corrupt practices in Ohio's political and judicial spheres; and to land a sticky mess of election fraud and judicial bias before the US Supreme Court and/or legislators convening to roll-call the presidential electoral college votes on January 6th, 2005. In an Ohio voters legal suit with potential to alter the outcome of the 2004 U.S. presidential election, the chief justice of the Supreme Court of Ohio has denied having personal knowledge of a plot to steal votes; has refused an emergency motion to recuse himself from the case and has declined a request to secure election evidence in the voters' legal contest of the Ohio presidential election result. 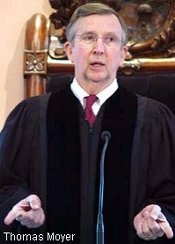 Chief Justice Thomas Moyer made the rulings[pdf] Wednesday in the 'Moss v. Bush' case taken by thirty-seven Ohio voters to reverse the awarding of Ohio's electoral college votes to George Bush. The voters suit is led by Columbus, OH attorneys Cliff Arnebeck and Bob Fitrakis. Moyer had been assigned to the case automatically by virtue of being the senior judge of the Ohio Supreme Court. In court documents, the voters had sought have another judge hear the case. One of the reasons they cited was that Moyer had "wittingly or unwittingly acquired knowledge of deliberate national and statewide election fraud." Moyer ruled that their assertion was "wholly without foundation and totally lacks any degree of veracity." The voters have yet to detail the basis of their claim. "Its speculative and ungrounded nature does not constitute grounds for disqualification," Moyer decided. He also thanked the voters for not claiming that he had any actual criminal involvement in such a plot. The suit claims that patterns of irregularities in the Ohio presidential and judicial elections on November 2, 2004 show there was an orchestrated election fraud plot which involved tampering with electronic vote tabulators and deliberately creating shortages of voting machines --predominantly in minority neighborhoods and college campuses likely to back John Kerry. The suit continues, but Judge Moyer also rejected a request to expedite a hearing and declined to grant discovery orders or ensure that elections boards preserve evidence from the election. Responding to the decision, Cliff Arnebeck, attorney for the Massachusetts-based Alliance for Democracy, which brought the cases said "the important thing about the judicial process is the concept that you have a neutral judge." "It's disappointing that doesn't seem to be the priority here," Arnebeck said. As well as contesting the result of the November 2nd. Ohio presidential election, the same voters are also disputing the election of Moyer himself on similar grounds --in the judicial elections held on the same day. Both cases were originally one suit, but an earlier ruling by Moyer ordered them filed again as separate cases. The presidential challenge case is no longer joined to that contesting his own election. As a result, Moyer says there is now no reason for him to remove himself, for he has nothing to gain by a change in the presidential result. Moyer's earlier move procedurally landed the case against his own election on the desk of Gov. Bob Taft. He assigned another Supreme Court judge ---who has also refused an emergency motion to immediately secure evidence, and has threatened to dismiss the suit. Joining the club is Ohio's newest Supreme Court justice, Judith Ann Lanzinger. At 3 p.m. this Tuesday, Chief Justice Moyer swore in Lanzinger, in a private meeting in chambers. She replaces retiring Democratic Justice Francis Sweeney, and her election increases the Republican political bias of the court's composition. Lanzinger will attend a public swearing-in ceremony on Jan. 7 that will be attended by Gov. Bob Taft. Earlier this year, Moyer did recuse himself in a long-running related suit to force the Ohio Chamber of Commerce to disclose who bankrolled television ads it ran implying that Justice Alice Robie Resnick, a Democrat, was being influenced by campaign contributions from wealthy trial lawyers. That suit had its genesis in another case also by Cliff Arnebeck. Moyer was among four of the Supreme Court's seven justices who recused themselves in the case. Moyer and Justices Resnick and Terrence O'Donnell, had benefited from the television smear campaigns of an Ohio Chamber group called "Citizens for a Strong Ohio." Judge Evelyn Lundberg Stratton, who was a target of the ads, also recused herself. Coincidentally, just this week the remaining Supreme Court judges --augmented by four appeals court judges temporarily assigned to the case, turned down an appeal against a lower court decree which imposed a potential $25,000-a-day fine for every day the Ohio Chamber group remains in contempt by refusing to reveal who funded the campaign. Arnebeck says the decision ends the appeals by the Ohio Chamber which have delayed imposition of the $25,000-a-day fine --absent an unlikely intervention by the US Supreme Court. "They're in contempt as of right now," said Arnebeck. The list of donors to the Strong Ohio campaign, if revealed could result in executives of twenty-five Ohio corporations facing legal charges, says Arnebeck. Corporate officers could get jail terms for making illegal biannual declarations regarding use of corporate funds for partisan political purposes. Arnebeck says that the ongoing failure to launch criminal investigations in the matter is an indictment of Ohio policing, prosecutorial and judicial systems. Ongoing developments in these issues have the potential to severely affect George Bush's claim on Ohio's electoral college votes; to blow the lid off corrupt practices in Ohio's political and judicial spheres; and to land a sticky mess of election fraud and judicial bias before the US Supreme Court and/or legislators convening to roll-call the presidential electoral college votes on January 6th, 2005. Just seven day away. A week, they say, is a long time in politics. In law also, perhaps. The 'Moss v. Bush' voters election contest is relentlessly exhausting it's legal remedies before the Ohio Supreme Court -a necessary prerequisite to any US Supreme Court appeal. Though grounds for the higher court review of Ohio's decisions are the subject of legal debate centering around the "safe harbor" provisions of Ohio's peculiar election laws. 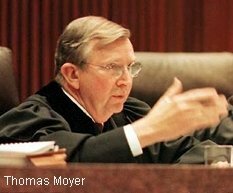 Chief Justice Thomas Moyer may find his refusal to recuse hard to defend, if reviewed by more exalted justices. The benchmark of judicial probity in all this was the rightful recusal by four Ohio Supreme Court justices --Moyer included-- in the "say or pay," $25,000 a day fines case over the 2000 judicial election smear campaigns. That earlier recusal, should have set the benchmark. This week's ruling on that case by the specially constituted Ohio Supreme Court --sans Moyer, came just two days before Moyer determined that the new Arnebeck/Fitrakis 2004 election suit was suitably tailored for him. Solomon-like he reached for their baby case and carved it in two. This decision despite the fact that the judicial and presidential voting cases concerned the same voters, on the same day, in the same state, using the same voting equipment, overseen by the same election officials, operating under the same procedures; tainted with the same undercurrents of political bias; and against the backdrop of possible illegal funding swaying judicial elections. Solomon could not carve such a baby. Neither should have Moyer. Even a Supreme Court predisposed to repeat the 2000 debacle and install its "favorite son" again, may balk of doing so if it means rubber-stamping a partisan hijack of the Ohio Supreme Court. Especially if that hijack proves to be illegally funded. Which is where the Ohio Chamber of Commerce and a raft of potential criminals among Ohio corporations come in. How much is it worth to the Ohio Chamber to grin and bear the potential $9 million a year cost of not disclosing their donors? Once the donors are known to be corporate entities, proof of malfeasance will not be needed. Their false declarations are already in the public record, to also taint the election of Ohio Supreme Court judges. By it's silence, the Ohio Chamber is protecting the judges. The decisions of those judges are serving to protect Bush. Is $9 million a small price to pay for keeping the lid on? Probably. After all, the mystery donors have already plowed $12 million into campaigns aimed at getting their choice of judges to administer justice in Ohio. A extra $9 million could keep the lid on things for another year. But only if the fine remains at $25,000 a day. Now that the specially constituted Ohio Court decision has started the clock ticking on the fine, perhaps the lower court will soon be amenable to a new application to increase the fine to ensure prompt vacation of the contempt. Such a move could be a show-stopper. The legitimacy of the reelection of George Bush, in the end may come down to a question of just how much Ohio hush money it is going to take to keep him looking legitimate. Battles over Recount amidst evidence of potential criminal activity by Fitrakis et. al. Certifiable election results by Richard Hayes Phillips, Ph.D. Under cover of John Edwards' late night promise to "count every vote," Kerry's lawyers have been adeptly pursuing evidence that could reverse the election outcome, while keeping their candidate so Teflon-coated that he remains untouchable by "sore loser," or "conspiracy theory" jibes. In the last few days, Kerry has launched a further escalation of his legal involvement, while also leaving casual observers even more convinced that Bush is safely ensconced in office. It was yet another political dance routine with Kerry's now familiar two steps forward, one step back footwork. If you haven't been following John Kerry closely, get ready to hear of surprising developments. 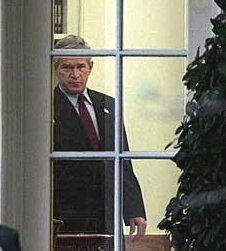 The vote-defrauded, potential president-in-waiting has just indicated that the validity of George Bush's reelection is no longer a given. Kerry's lawyer confirmed that Kerry will be seeking to expedite court proceedings in an ongoing recount suit by the Green and Libertarian parties. That might sound like just another "count every vote" exercise by Kerry, were it not for two important details. John Conyers, Jr., the ranking Democrat on the House Judiciary Committee is confident that a few U.S. Senators will join House members on January 6 to question the November 2 election. Conyers has thrown a spotlight on GOP vote crimes. How 'high' these crimes can be connected is another story. Those who act in concert with others to violate the Voting Rights Act or related laws should be confronted with the prospect of conspiracy charges in addition to criminal penalties (prison time) for individual offenses. That’s the way gangsters are brought down, every day. "He and others in Congress are considering formally challenging Ohio’s vote, Jan 6th." The House Judiciary Cmte., meeting in Ohio to investigate election vote irregularities, has heard that preparations to conduct a fraudulent recount are underway statewide. In early testimony, chairman of the forum, Rep. John Conyers heard from Green party presidential candidate, David Cobb say that employees of punch card vendor, Triad Governmental Systems, Inc. are attempting to orchestrate a fraudulent recount of precincts likely to be included in the first phase of the recount process. by Supreme Ct. Justice Anthony M.
Kennedy in dissenting Bush v. Gore. "Nearly two months after Election Day, some John Kerry's die-hard supporters have yet to give up"
Rigged vote in Lucas Cty. Making it harder to vote in Ohio and harder to recount. Dude, Go Visit Your Own Damm website! uncensored by ABC, CBS, NBC, CNN, MSNBC, FOX.